They may not immediately seem the most exciting documents we have in the archive but I have found myself using our title deeds, leases and conveyances frequently over the last few months. Examples include doing research for enquiries about tenant farmers or land ownership, in searching for information to support planning applications and estate reports, and as background for study sessions and exhibitions. 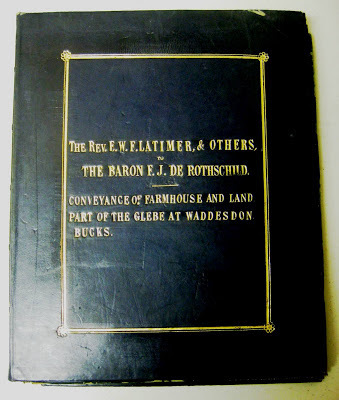 We have a fabulous collection of title deeds for the Waddesdon Estate. The earliest deeds date back to the 1660s and we have others in the archive that are less than 20 years old. They document the ownership of the land across four centuries and record Baron Ferdinand’s purchases in the 1870s from the Duke of Marlborough and Count d’Harcourt as well as harder-fought acquisitions from smaller landowners. The title deeds take a number of forms but the legal terms remain the same, gifting and conveying the land from one individual to another with plans and descriptions to ensure it was clear exactly who owned what. Cope of EPF lease, 1933. © National Trust, Waddesdon Manor. We also have an incomplete set of tenancy agreements for the estate. These are important legal documents outlining the rights and responsibilities of the landlord and tenants to one another and to the land. The terms of the tenancies on the Waddesdon estate changed little between the 1860s and 1930s. The tenant’s responsibilities extended to using up-to-date farming techniques. Not only must the tenant farmer maintain the property in ‘good and substantial repair’ but they were to ‘manage and farm the lands hereby let according to the best and most improved course of husbandry.’ This indicates that landlords expected tenants to engage with modern farming methods and progressive techniques.These deeds are not only interesting in telling us how Ferdinand created the consolidated estate we see today but also give details of businesses such as the Silk Mill which operated on Silk Street, indicating where that name came from. They also record field names that may no longer be in use and give an indication of the value of the land at the time of purchase. All of the tenancies on the estate were renewed on a yearly basis rather than long term rentals. In the nineteenth century the use of short year-to-year leases had been criticised by radical thinkers. Annual leases did not give farmers security, meaning they would be less likely to improve the land as they could not ensure return on their investment. The Agricultural Holdings Act of 1875 was intended to stabilise compensation farmers received for the improvements they made but the policy was not popular with all tenant farmers who argued that ‘Buckinghamshire farmers liked to make their own bargains with the landlords.’ In the uncertain economic climate caused by the depression, short tenancies gave both tenants and landlords a suitable exit strategy and many farmers preferred them. Waddesdon estate title deeds. © National Trust, Waddesdon Manor. As well as giving us the names of tenants working on each farm and living in houses in the village the tenancies give us information about the way the land was used indicating arable land, pasture and woodland. Where we have a number of agreements for the same farm they also show how the rental value changed over time. When used with other archives they help to build up a picture of how the estate was run.